I Have Run: I got flowers from Bouqs! And ate a grilled cheese. I got flowers from Bouqs! And ate a grilled cheese. I went to lunch with a friend today. And I had this, which was more delicious than it looks. Swiss cheese, ham, dill pickles, special sauce, grilled to warm yummy gooey perfection. I called it carb loading for my long run. 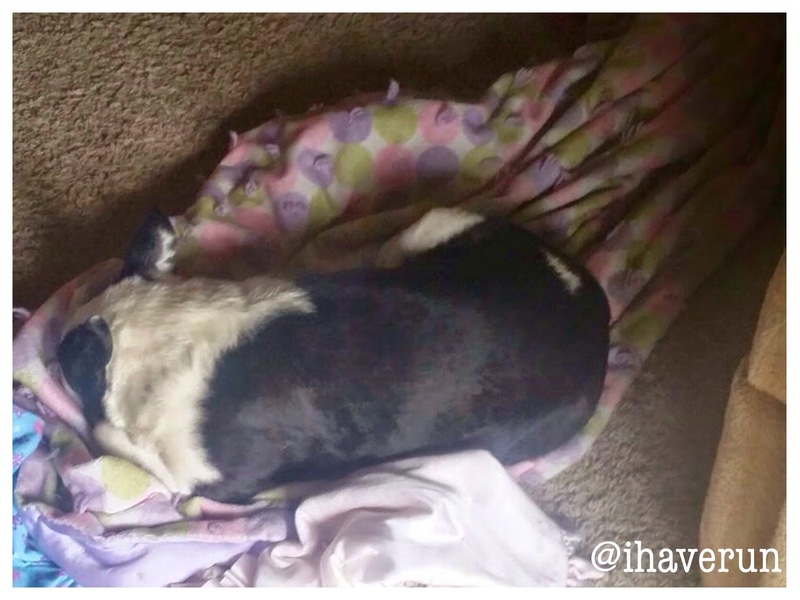 So since he couldn't get on her bed, he found her blanket on the floor, which wasn't even in her room. What you can't see is that there were several other blankets on the floor, but they were all Ellie's. He is clearly very attached to the Princess, who he sleeps with every night. This is the Hot Lava bouquet. It is my first Bouqs delivery, but won't be my last. The flowers from Bouqs are cut the day they are ordered and delivered 2-4 days later. They have the most incredible selection of so many beautiful bouquets that are only $40 with shipping included. Or you can double the size of the bouquet for just $10 more! And the ordering process is so simple. And everyone loves flowers. It's a no brainer. Order flowers from Bouqs. And now I'm off to put that grilled cheese to good use with my long run. Happy Friday everyone! What is your favorite flower? My favorite are tulips, but I also love roses. What are your favorite grilled cheese additions?